Mars, wearing a signature fedora, kicked off the performance with a high-energy take on his hit single “Locked Out of Heaven,” from his latest album, Unorthodox Jukebox. With Mars’s song drawing clear inspiration from the Police, it was rather fitting that Sting emerged to join the pop star, crooning the second verse of the song with his bass in tow. The roles were then swapped: Sting launched into the reggae-tinged 1979 Police classic “Walking on the Moon” as Mars provided both vocal and guitar support. 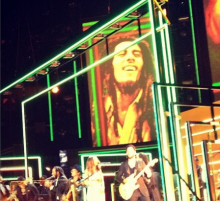 “None of this would be possible without Bob Marley,” Mars exclaimed before introducing Rihanna and Ziggy Marley. The two arrived onstage, swapping vocal turns on a harmonically precise cover of “Could You Be Loved.” Ziggy’s younger sibling, Damian, arrived onstage next. The rapper/singer added a wild rap verse to the rock-steady cut, rounding out what was undeniably one of the highlight performances of the evening.